An essential skill for all Marine Mammal Observers is the ability to estimate range to a sighting. Demonstrated here is how to estimate range using reticle binoculars. Before you start, measure your eye height whilst wearing work boots, followed by the height of your observation platform. If the information is not readily available, use a plumb line, which is essentially a weight on the end of a piece of string. Drop the weight over the side, until it reaches sea level, mark the string, and then measure the distance from the weight to your mark. In addition to these measurements, you will need to know the number of mils in each reticle of your binoculars; refer to your binocular specifications. Add together your eye height and the height of the observation platform to find your height above sea level. 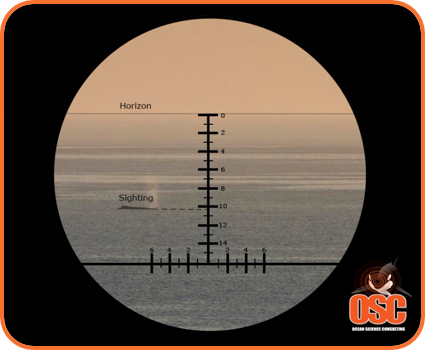 When a sighting occurs, place the top division in the reticle scale on the horizon and count down to the animal. Using the number of reticles, work out the number of mils, for example if an animal is sighted at three reticles and each reticle is 5 mil, then that’s 15 mils. To speed up this process when in the field, it is advisable to put the equation into an Excel™ spreadsheet; a pre-made one can be downloaded here. A table, like the one below is produced, which allows sightings to be translated into distance instantly.